By the end of the 1930's, Powell Crosley Jr. had distinguished himself in the business world as the highly successful creator of radios and refrigerators, both bearing his name. In addition, the Cincinnati Reds ball team belonged to Crosley, as well as the most powerful radio station in the world during World War II, WLW. Crosley, a Cincinnati native, was truly a legend in his home town and a respected captain of industry elsewhere. Crosley had attempted the production of a low-priced car as early as 1907. Called the Marathon Six, it barely left the "drawing board" stage. He tried again in 1911, this time with his concept of a cycle car. A few prototypes were cobbled-up, but it too went nowhere. Henry Ford won this first battle of producing a car for the masses, but Crosley knew it was just a matter of time before he would become the next major manufacturer of automobiles. The next two decades went by quickly for Crosley and his dream of an "ideal all-purpose" car actually made it to production for the 1940 model year. Called the Crosley Convertible, it was powered by a 2-cylinder, horizontally-opposed air cooled engine displacing 35.3 cubic inches. It produced 12 horsepower and could propel the 80-inch wheelbase car to 50 mph. The only major impact of this little car was its mileage capability — 50 mile per gallon. 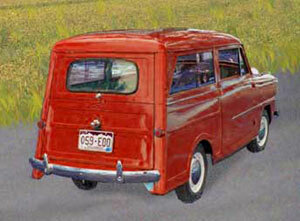 This kept Crosley's name alive during the war, since his tiny cars became sought-after due to gas rationing. Two thousand, seventeen Crosleys were produced in 1939 and an additional 3700 were produced through 1942. During the war, Crosley had military contracts to build all sorts of special-purpose vehicles like motorcycles, amphibians, motorized tricycles and snow tractors. He couldn't wait to get back into the production of cars. At the end of the war Crosley went back into the production of automobiles in a big way. By the end of 1947 he had sold 16,637 of his second-generation models, this time powered by a novel, sheet metal, cylinder block engine which produced 26.5 horsepower and weighed only 59 pounds. The engine had a single overhead camshaft and revved to 5400 rpm. The car was still small (only 49 inches wide) and low priced at $880. The transmission was a three-speed unsynchronized unit, the suspension was old-fashioned beam axle type, front and rear. 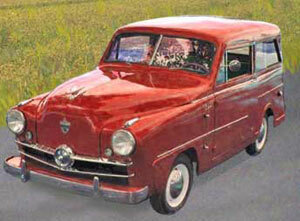 By 1948 Crosley had his best year yet with sales of 30,000 of his little station wagons and convertibles. He introduced two new models for 1949, the Hot Shot and Super Sport (first cars to offer disc brakes on all four wheels), both of which were even smaller than the basic cars, with wheelbases of just 67 inches. People bought them, though, no doubt for such reasons as price and availability. After all, the Big Three were still trying to catch up production after the war. Crosleys were advertised with such slogans as "It's smart to own a Crosley" and "America's most needed car". The ads always emphasized the lowest prices of any manufacturer, with the 1952 station wagon selling for $1076. President Eisenhower, Nelson Rockefeller, Humphrey Bogart and many other notables owned Crosleys. The little Crosley engine held together in racing forays quite well and powered many SCCA wins. Unfortunately, sales kept dwindling each year and Powell Crosley got tired of giving cash transfusions to the company in 1952. That year, he sold the company to General Tire and Rubber and the rights to the engine were sold to Fageol Marine Engine Company. The engines powered boats for many years afterward. So Why Didn't The Crosley Succeed? Contrary to popular myth, the Crosley wasn't ahead of its time. Comparisons have been made to the VW and MG and others but these really aren't fair. The simple truth is that the build quality of Crosleys just wasn't up to par with other manufacturers. The Crosleys were too plain, ill-fitted, rattly, harsh-riding and way, way, way too small for the typical American buyer. They were doomed to be an automotive oddity by their fundamental concept. Powell Crosley Jr., on the other hand, was not a failure. He may not have realized his dream of becoming an automotive baron by the time of his death in 1961, but the chances are very high that those Crosley radios and refrigerators made long ago are still working today! Crosley cars can be found today, with prices varying from $500 for a rough, restorable one (F condition) to $3500 for a decent condition driver (C condition) to $8000 for a top-level restoration (A condition).